Cyclists Mark Cavendish and Peter Kennaugh have been included in the Isle of Man's largest-ever Commonwealth Games team, selected for Glasgow 2014. Forty-six athletes, including former Commonwealth gold medallist Cavendish and Olympic gold medallist Kennaugh, will compete in nine of the 17 sports. IOMCGA president Juliet Holt said it is a "very accomplished group". She said: "It is the biggest and strongest squad ever to represent the Isle of Man - with real strength in depth. "In Melbourne we topped the medal table per head of population and came second in Delhi. We are well used to punching above our weight." 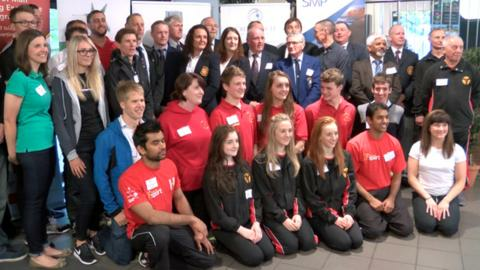 The largest Manx teams will represent cycling, gymnastics, shooting and swimming. Cycling coach Mike Doyle said: "There is a lot of quality in our team. We obviously hope Mark (Cavendish) comes out of the Tour de France fit and raring to go. "We have 10 in the team and the experience is fantastic both on the road and track." In 2010, the Isle of Man sent 31 athletes to Delhi, winning two bronze medals. Cyclist Mark Christian won the island's first in the 40km points race, with help from fellow Manxman Chris Whorrall, and shooter Tim Kneale also claimed bronze in the individual double trap event. Both men have again been selected for Glasgow. Meanwhile, the Queen's Baton Relay will arrive in the Isle of Man on 16 May. Seventy-one nations will compete at the Games, with the opening ceremony held at Celtic Park.